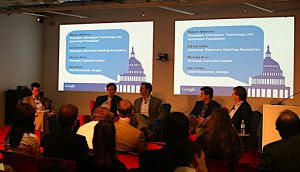 Earlier this year we launched a series of "Google D.C. Talks" in our new Washington office, with the goal of informing the D.C. community -- congressional staff, Administration officials, think tank and trade association reps, and journalists -- about Internet policy issues (see the photo at right of our last talk, on the "state of the Internet economy"). This Friday, September 12, we invite you to join our next talk, which looks at "cloud computing" -- the movement of computer applications and data storage from the desktop to remote servers -- and issues for policymakers to consider. "Cloud Computing: Navigating the next frontier"
As part of the talk, the Pew Internet & American Life Project will present a new research report on the "Use of Cloud Computing Applications and Services," examining consumer attitudes and experiences with cloud computing. Experts from Salesforce.com, Georgetown University, and the Center for Democracy and Technology will respond to the new report and share their own views on this new computing model. D.C. denizens -- we hope you can join us this Friday. For those of us not located in DC but still very interested, any chance of creating a live or archived feed? Any chance Google D.C. could create a shared Google Calendar for its future talks? I'd have loved to attend this but didn't have enough advance warning to put this in my schedule. I agree about Google putting out a calendar regarding this event. Google has put a lot of resources into its DC efforts lately, but has done a poor job of notifying the press and bloggers of important DC-related events. All this and finally the Washington Post decides to let everyone know "Hey! Google is in town." Story link here : http://www.washingtonpost.com/wp-dyn/content/article/2008/09/28/AR2008092802216.html (I think it requires a free WP login to get to the content).